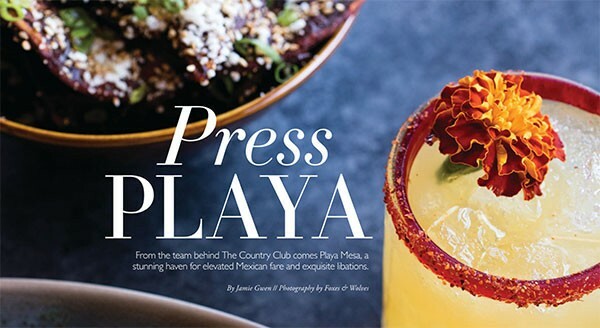 From the team behind The Country Club comes Playa Mesa, a stunning haven for elevated Mexican fare and exquisite libations. Seventieth Street is bustling with good eats. 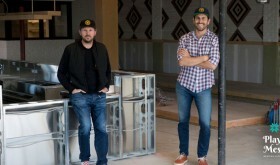 The burgeoning gentrification is in full swing, and you can now curb your cravings for carnitas and killer margaritas on the Costa Mesa strip. 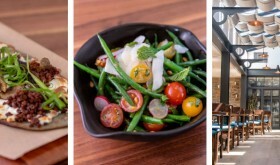 From the restaurateur partners who brought us the much-adored hole in the wall that is Wild Goose Tavern and the trendy country club comes Playa Mesa Mexican Kitchen, a beautifully designed authentic canteen that impresses. 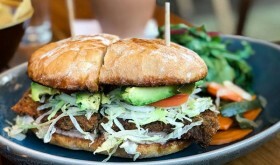 You'll find a bevy of tacos made with hand pressed corn tortillas; excellent fresh fish; superb enchiladas; and more. It’s elevated Mexican fare, and the neighborhood is loving it. 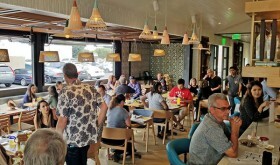 "We've all been anxiously awaiting this opening,'' says co-owner Mario Marovic "Playa Mesa has this special calming effect that takes you co another place, somewhere south of the border, even only just for lunch." 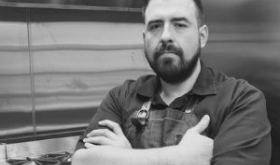 Chef Rolando Rubalcava of Taco Maria fame is at the helm in the kitchen, and along with Marovic and Andrew Gabriel, the brains behind the business, they all know their stuff. 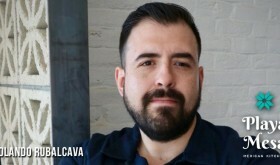 "It's both humbling and inspiring to see Mexican food, especially simple and authentic dishes, becoming more recognized as a respected cuisine," says Rubalcava. "This is the food I grew up eating." chairs in punchy real; living walls dripping with succulents frame the space; and a welcoming indoor-outdoor patio burns bright with fire pits and twinkling string lights. Peruse the ultra-premium tequila list and you'll be captivated by the 70- plus offerings, accentuated by a generous handful of mezcals for sipping. Try your hand at the smokin' Pina co find a union of mezcal, Italian vermouth, vanilla bean and pure pineapple for a taste sensation that will incite your appetite. Or choose a Baja beer on rap from their worthy selections. 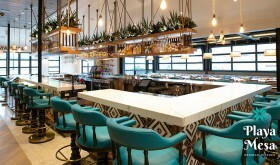 Then, prepare to feast Cozy up among the colorful pillows that line the banquettes for the best sear in the house; you'll salivate as soon as you begin your analysis of the menu. Scare with snacks, before you fill up on the signature fire-roasted salsa and addictive tortilla chips. The aguachile arrives with a crudo of raw, th inly sliced scallops that are bejeweled with velvety avocado and textural cucumber, then sauced at the table with a vivid and spicy mixture of orange juice, lime, serranos and extra-virgin olive oil. It's so delicious you might consider ordering seconds, but refrain because there are tacos on the horizon. Playa Mesa's cirrus Jidori chicken seasoned with achiote; a vegetarian taco brimming with oyster mushroom confit; and a notable carne asada plate ranked highest on my taco standings, all of them constructed from hand pressed organic corn tortillas and complemented by traditional Spanish rice and beautifully cooked beans. For chili heads in the know, ask for a taste of the chi le d'aceite for the table, a housemade mixture of habanero and Chile de arbol in oil where a li1cle goes a long way. Clockwise from top left: Chef Rolando Rubalcava; camarones ala dibalia– Mexican shrimp with chipotle, butter and caramelized onion; the tasty carne asada plate featuring grilled Aspen Ridge ranchera. For large plates, the sarandeado, a perfectly grilled whole trout, is gorgeously filled and set atop a potato has with charred corn. The Plato del Parron is the perfect family-size platter, which includes crispy skinned chicken, cesina (an anise-cured beef) and hunky pork spare ribs. Served with warm tortillas and all the necessary fixings, it's abundant for grazing. To finish, the bunuelos con nieve are hard to pass up. Honey glazed cinnamon sugar tortilla are served with a scoop of ice cream, and you just need a bit to satiate your sweet, tooth. Yes, Playa Mesa, we welcome you.